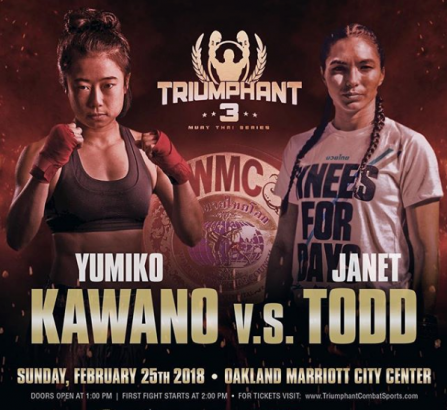 ​Yumiko and Todd match off again in Triumpant 3 Promotions event Sunday Feb 25, 2018! Yumiko and Janet first fought last year on BackForwardKick’s SheFight Promotion in Toronto, Canada. These two well-respected and highly talented fighters continued to top their divisions throughout the year. Yumiko became the Pan Am Gold Medalist (54kg division) in Oct and Todd took home the Bronze Medal (51 kg disvion) at IFMA Worlds. Sunday Feb 25, they meet at 115lbs in California, USA to face off in what is set to be an edge-of-your-seat competition. Join us in cheering on our very own as she takes the ring to tell her story! Special thanks to Triumphant Promotions for taking care of our team and making these opportunities possible. YUMIKO KAWANO IS NOW THE IFMA PAN AM GOLD MEDALIST!!! We thank you so very much for your endless support and encouragement. We are looking forward to an adventurous and exciting year ahead! Yumiko Kawano (also known as the Samurai Killa) is a fiery, entertaining, experienced fighter with the heart of a Samurai. Born and raised in a small town amidst the majestic mountains and ocean of Japan, Yumiko is a true martial artist at heart. Her love and dedication her school, her team, her Kru and Muay Thai have taken her to competition across North America and now over-seas. Yumiko’s story as a Canadian started in 2007 when she took a leap of faith and decided to leave her home in Japan and study abroad. With the love, support, and ambition of her parents and sister (her heros) she secured an acceptance at the University of British Columbia where she studied sociology and anthropology, with a focus on First Nations Studies. Coming on board as an international student, Yumiko spoke very little English but that did not stop her. She quickly applied her Samurai spirit, learned the language, the discipline, and the study and continued on to graduate as a top student in her program. During her time at UBC, Yumiko’s big heart guided her to give back to her new found home. She was involved in community programs, preparing breakfast for those in need and also participated in a monumental creek revitalization project in the Masquem territory. Noted by her professors for her ability to meet challenges with optimism, her giving heart, and her ability to consistently conquer her goals and master her craft, she was invited to join the Social Justice Education Faculty at OISE (Ontario Institute for Studies in Education) – An internationally acclaimed faculty at the University of Toronto. ​In Yumiko’s Ph.D work, she is busy documenting Aboriginal women and women of colors experiences in the academy, in particular graduate level programs, focusing on how violence has been institutionally manifested, maintained as well as reproduced, and how these woman negotiate and claim their space in the academy. Her unique approach is to utilize their stories in dealing with day to day challenges in the academy. Yumiko is a strong believer that “stories are who we are” and today, she is working to complete her thesis and tell her own story. In 2013 Yumiko found Muay Thai by accident. She was handed a class pass at a university event and attended a class at Krudar Muay Thai. There she met some of her greatest friends, a supportive community, and fell in love with the art and sport of Muay Thai. Training inside and out, balancing her academic career, her family over seas, and rigorous training was just another goal that Yumiko would conquer with ease. ​Yumiko quikcly progressed and in 2015 she had her first pro fight in NYC. Since then Yumi’s spirit has been on fire. She is an avid spin, rock climbing, strength and conditioning, and Muay Thai athlete. She trains hours each day, sharpening her skills, and improving her athletic abilities. In Mar 2017 Yumiko participated in a very important card to support International Womens Day, an event that was right at home with her. She was granted an opportunity to fight one of the leading female Muay Thai competitors in her class and with the roaring cheers of her fans and family at Krudar, she took home a significant win and earned her name in senior level competition. With this experience, Yumiko has expanded her vision to include world class fighters and has ambitions to compete against the best in the world. ​Yumiko continues to write her Thesis and has goals to complete her Ph.D this year along with taking home some prominent championships in the Muay Thai world. No goal has ever seemed to big for Yumiko, and we are incredibly excited for her journey ahead. As her favourite quote goes “The truth about stories is, that’s all we are” (by Thomas King). Yumiko is eager and ready to tell her story in the ring.